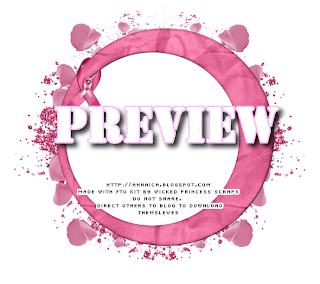 This cluster frame was made with the free Breast Cancer Awareness kit called Paint the Town Pink made by Wicked Princess Scraps. It is a gorgeous kit! This is the tag I made with it! Follow the steps below if you want to make one to! The FTU tube is by Ralf Straaberg and can be found at Dreamscape Imaging HERE and using your DSI license number is needed with this art. 1. Open up a new canvas size 800 x 800 should be sufficient. Go to LAYER>TRANSPARENCY>COLOR TO ALPHA to make transparent. 2. Open as new layer the mask and scale to 650 x 650 then go to COLOR>INVERT and LAYER>TRANSPARENCY>COLOR TO ALPHA. 3. Open as new layer paper 16 from scrapkit. Right click on this layer in layers box and choose ADD ALPHA CHANNEL. Then right click on the mask layer and choose ALPHA TO SELECTION. Click again on paper layer to make it active and go to SELECT>INVERT and EDIT>CLEAR. Now paper 16 is the mask, so delete the original mask. 4. Open as new layer the cluster frame. 5. Add your tube of choice, for this one I scaled it down just a little bit. I added a drop shadow by going to FILTERS>LIGHT & SHADOW>DROP SHADOW with settings at 1/1/1 and again at -1/1/1. Then I duplicated the tube layer as you can see below in this screenshot. Click on the frame layer to make it active now... then use the fuzzy select tool and click within the center of the cluster frame. Click on the original tube layer to make active, then go to SELECT>INVERT and EDIT>CLEAR. Now click on the top (copy) tube layer to make active. Use the rectangle select tool to crop out JUST the bottom portion of this layer. 6. Open as new layer paper 19 and scale to 500 x 500. Right click on this and choose ADD ALPHA CHANNEL also. Then use the ellipse select tool to crop the paper just inside the boundaries of the frame. Go to SELECT>INVERT and then EDIT>CLEAR and set this layer directly behind the cluster frame layer. 7. Use the provided copyright info to type out your own text, use copyright symbol, artist's name, website and for this artist, you must use your license number whenever you use his art. Place this information somewhere so it is easily legible. 8. I used a font called Amazing Ruler. I color picked the shade of the frame and then used the text tool and wrote in my name. Right click on this layer and choose ALPHA TO SELECTION then add a new layer, and fill that layer with white. Add a decent drop shadow. Now for the pink text, add noise by FILTERS>NOISE>RGB NOISE and settings at 20/20/20/0. Then go to FILTERS>DECOR>ADD BEVEL with thickness at 5. Add a bevel to the white text layer also. 9. Use the rectangle select tool to crop your work, when you made a selection go to IMAGE>CROP TO SELECTION. Thank you so much for this post. 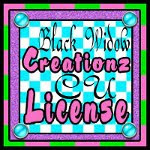 I want to let you know that I posted a link to your blog in CBH Digital Scrapbooking Freebies, under the Page 1 post on Oct. 06, 2011. Thanks again.